Weaver Bathroom Remodeling specializes in shower tile installation, environmentally-friendly bathroom renovations and handicap bath and shower redesigns. Weaver Bathroom Remodeling is dedicated to quality bathroom designs for every lifestyle, with a specialization in custom tiled showers. If you are seeking a professional that has an exceptional range of experience in remodeling, upgrading, designing, and installing residential and commercial bathrooms at an affordable price, look no further. Our goal is to make sure that your project is a stress-free experience and that we meet your needs, both in function and design. With such a large array of bathtubs, showers, tile, flooring, faucets, sinks, counter tops, cabinets, vanities, and other bathroom fixtures and products to select from, a bathroom remodel can seem like an overwhelming task. 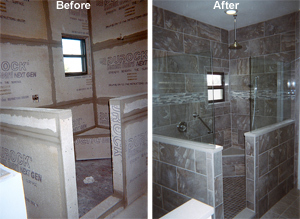 Weaver Bathroom Remodeling makes it easy. From start to finish, you’ll communicate with state-certified contractor and business owner, Mark Weaver, who has proven to be both reliable and knowledgeable. He will walk you through the bathroom remodeling process one step at a time, providing guidance, education and personalized recommendations that compliment the vision you have for your new bathroom. Make your bathroom energy efficient or handicap accessible, simply upgrade an out-of-date bathroom, or complete a shower to tub conversion (and vice versa). Mark will make it happen. Weaver Bathroom Remodeling, an owner-operated company, appreciates your visit to our website and suggests that now is the perfect time to contact us to set up a FREE ESTIMATE & CONSULTATION. Weaver Construction And Remodeling, Inc.